As the slow burn Maker Movement takes on the multimillion dollar companies that once monopolised innovations, we now have the choice to become a more active consumer rather than a passive one. Dabbling in technology is being encouraged on all levels, especially at the convergence of wearable and fashion tech. Startups are stimulating creativity in designers, students, tech enthusiasts, early adopters and hobbyists of all ages, as well as other tech startups. So the question is, are you ready to get your tinkering on? If you are, here are some tech kits that will definitely make a wearable tech enthusiast out of you, if you are not one already. Loomia, whose technology has been integrated by clients such as Calvin Klein, Google, Zac Posen, and The North Face, has created the TILEtag, an out of the box solution that can be sewn on to make any garment a data stream if the wearer chooses. Described as an "upgrade" by Janett Liriano, chief executive officer at Loomia, the technology has been designed to operate in an ecosystem that allows users to collect data and sell it to brands and consumer research firms. The Loomia Electronic Layer is a thin layer of circuitry bonded to everyday objects such as clothing, car interiors, handbags and office furnishing. It brings functionality to everyday objects by collecting data from consumer habits, including frequency of wear, location, level of activity, and temperature. It then stores this information on a hardware component called the Loomia Tile. "Brands that would benefit from our latest offering will be a brand that seeks to build a specific but private relationship with their customers, understand how their products perform, are used post-sale, in contrast to their other SKUs and competitor items. Also, brands that wish to leverage data for better product planning, inventory management, trend spotting and retargeting through a willing user base," said Liriano. She added that footwear brands could also benefit from using Loomia's technology in shoes. The wearer will be able to measure steps, activity and so on. Founder of the 360Fashion Network Anina Net has come up with a solution that could play a role in helping build a bridge between fashion and technology – the 360Fash Tech Kit. This could be the perfect solution for fashion designers and brands who want to power up fashion without coding. "We want to make it possible for fashion designers and creatives to focus on what they are good at - design and integration as first steps into fashion tech and not coding and soldering," said Anina. Currently, there are various kits that you can purchase. There is the plug-and-play Totwoo Love Kit which is a collaboration between 360Fashion and China’s smart jewellery brand Totwoo. Targeting jewellery designers, they have made it easier to create pieces of smart jewellery with features like activity tracking, alerts and social features via haptics and lights. For those who like to design fashion garments, there is the 360Fash Tech Robotic Dress Kit which comes with everything you need, minus the dress. I also quite like the sound of the Heating Coat Kit which uses soft patented nanotechnology heating fabric to warm up the wearer on a cold night. As Anina explains: "Each kit also comes with the opportunity to become part of the 360Fashion Network and take advantage of our mass manufacturing services and partners in China and around the globe to create a real product and bring it to the market". Looking to appeal to top fashion designers, creatives, and semi-professionals, cosplayers, costume makers, and non-professionals, the 360Fashion Kit includes all the hardware you need. For $500 you can order one of the following: LED Bag Kit, Motion Kit, Robotic Dress Kit, Weather Kit or Gesture Kit. The package also includes designing, implementation, and software support. MakeFashion, founded in 2012 by Maria Elena Hoover, Shannon Hoover and Chelsea Klukas, is the fashion tech startup behind StitchKit, a kit that will give you an introduction into the wearables and fashion tech space. By lowering the barriers of entry, Stitchkit provides a novice or expert user with the tools they need to create. "We’ve created StitchKit in different stages, from no programming required, to simplified programming, all the way up to the crazy sensors and whatever you can imagine after that," explained Maria, chief production officer at MakeFashion. The StitchKit consists of a specially designed Arduino board built for fashion tech and wearables, a simplified USB controller with pre-programmed light patterns and different types of sensors (e.g. sound, movement) built upon the Grove Sensor system from SeeedStudios. Starting price is from a very affordable $40 for the essential Fashion Tech Kit to $160 for the Fashion Tech Creator. Technology Will Save Us (TWSU) is changing the relationship we have with technology. They have been on a mission to spark the creative imagination since 2012. Founded by husband and wife team Bethany Koby and Daniel Hirschmann, TWSU have come up with award-winning make-it-yourself kits and digital tools. "We felt there was a need for a business that could do a better job at empowering and inspiring the next generation of creators to create with tech in a fun and hands-on way," said Koby. One of their most popular kits is the micro: mega pack which includes micro: bit, micro: bot and micro: craft kits for coding and making. Plus their Mover Kit is a wearable based kit for kids. Partnering up with the BBC, TWSU designed the ultimate micro that encourages creativity and invention for those wanting to code and make. "While our kits are designed primarily with kids in mind, we want them to embark on their creator journey with the grown-ups. However, some parents are intimidated by tech. They don’t understand it, but they want their kids to embrace its possibilities," explained Koby. With two new kits launching this autumn 2018 that will introduce electro thread and wireless power, you can grab the micro: mega pack for £74.99. It will teach you how to problem solve using craft and code, give you hands-on experience with hardware, sensors and electric circuits. As this DIY subculture continues to provide hands-on access to technology, we wanted to make sure that we also gave honourable mentions to a few more startups contributing to the evolution of fashion tech. First up, there is the Sustainable Modular e-textile Kit by Anna Blume, Adrian Freed and Lara Grant, which is an e-textile Kit for people with physical disabilities. Awarded full funding from the EU WEAR Sustain competition, they are now busy developing an open source e-textile interface kit with curated components, module designs and the base kit that will be made available online with build plans promoting design-for-repair features and methods. Then there is blink blink, whose Wearable Tech Kit gives you the necessary tools to create things like LED light-up scarfs and pressure sensors for wearables. Designed by Nicole Messier and Alex Tosti, their kit, targeted at both young and old, gives users the necessary tools to engineer sewable circuits into DIY arts, crafts and fashion tech projects. Lastly, we have to mention Adafruit. The 100% woman-owned company founded by MIT hacker and engineer Limor Fried has been designing products for makers of all ages and skill levels since 2005. 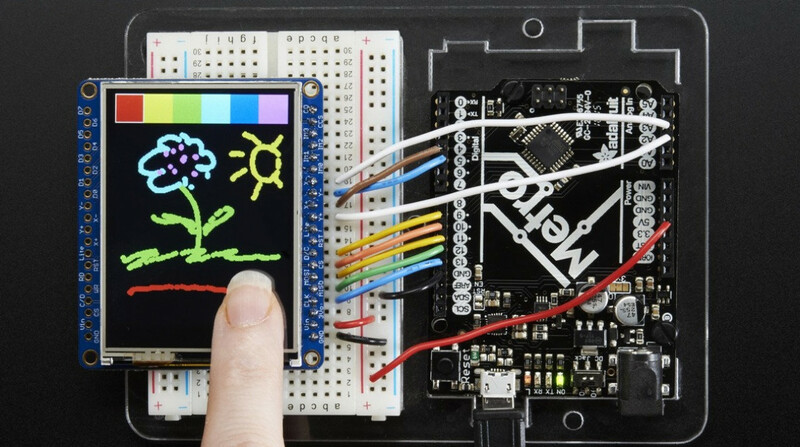 Offering creatives tools, equipment and electronics, Adafruit Kits, such as Flora (above) for wearables, come with all parts required, including a custom printed circuit board and any pre-programmed chips. The 360Fash Tech Kits May appear to be higher priced, but it looks a lot more like a finished product which offsets what you would pay an engineer to develop it from scratch.